After it sold out in record time, we upgraded the limited edition 2013-2014 Holiday Brush to a permanent part of Wayne Goss’s collection and gave it a new name: Brush 00. Designed for quick application with a luxuriously soft feel, Brush 00 picks up and deposits powder products evenly for a natural, airbrushed finish. Available in white or black. Apply powder foundation or setting powder to large areas of the face with a broad sweeping motion. Use the pointed tip to apply precise amounts of powder to targeted areas, such as the curves of the nose and the eye area. To blend, use circular buffing motions until a seamless look is achieved. 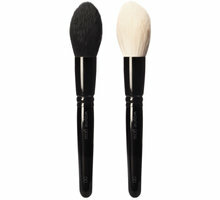 Wayne's tip: The bristles splay out with firm pressure, allowing you to cover more area when applying blush or powder. Appropriately named Brush 00 for its dual color ways, this set is the ultimate powder duo. I can't say enough about this brush! I did a point-by-point comparison to the MAC 138, and this brush wins in every way possible. The fibers are easily the softest of any brush in my collection, comparing only to an Estee Lauder brush from the Aerin collection, but softer. The fibers are surprisingly firm, and spring back totally after running your fingers over the tips, unlike the MAC 138 which will remain slightly askew. The MAC brush feels like steel wool in comparison, and this brush feels like pure luxury on the face! Goss's Holiday brush even picks up pigments and powders better, needing fewer swipes across a pressed pan to pick up product than the 138 requires. 2 passes across a MAC Mineralize Skinfinish Natural picks up more product than 3 passes with the MAC 138. The tip maintains the perfect point, making it ideal for under-eye powder setting, highlighting and contouring, and blush (even on my face--I have a very small face), but it is still large enough to easily cover the entire face woth setting powder! I never imagined it could be so versatile, and I was even worried I had overspent and would regret my purchase. On the contrary, I would happily buy a second brush for my kit if it were not the holidays and I had the extra money laying about! If you can afford two, DO IT, you won't regret it. This brush is absolutely amazing. I have the Goss collection and when I saw this brush, I knew it must be mine!! Gorgeous, just perfect. The first few minutes after I unwrapped it was spent brushing my face over and over. So soft and decadent. Thank you Wayne for making these fantastic brushes. I hope there will be more?? hint hint. 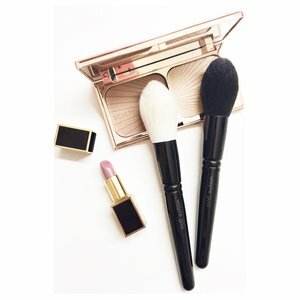 I want to compliment Beautylish on their customer service for a minute-I have never had such great CS from anywhere in my life. I was kept abreast of the brushes delivery on a regular basis, if there was a delay I was let known. I more than appreciate that. That is why I will be a customer for life. Thank you. I agonized over getting this brush because was it really worth $85? But I decided to just take the risk. I am so glad I did. I have dry skin and have struggled with brushes being too rough and accentuating the dry skin. But this brush, this brush has fixed it! I used it to apply my mineral makeup, and it was flawless. I then used it for blush and highlighting and still flawless! This was well worth the cost, and if I had to do it again, the only thing I would change would be to buy it sooner! I am obsessed with brushes and throughout the years I have purchased a lot from Mac, Sigma, and other brands but this brush is like no other I have ever owned! It's the softest thing ever, picks up just the right amount of product and applies it beautifully. I know this is a pricey brush but now that I have been able to play with it I can honestly say it is well worth the money. Shipping was super fast too, I received it the next day after I placed my order. My love affair with Goss Brushes is obvious. Yes, I just ordered my 4th Holiday Brush; two were gifts (very lucky friends) and now I will have two for me, in addition to the complete brush set I preordered and use daily, Oh yes, I have also ordered additional Brush 2, 3, and 4. 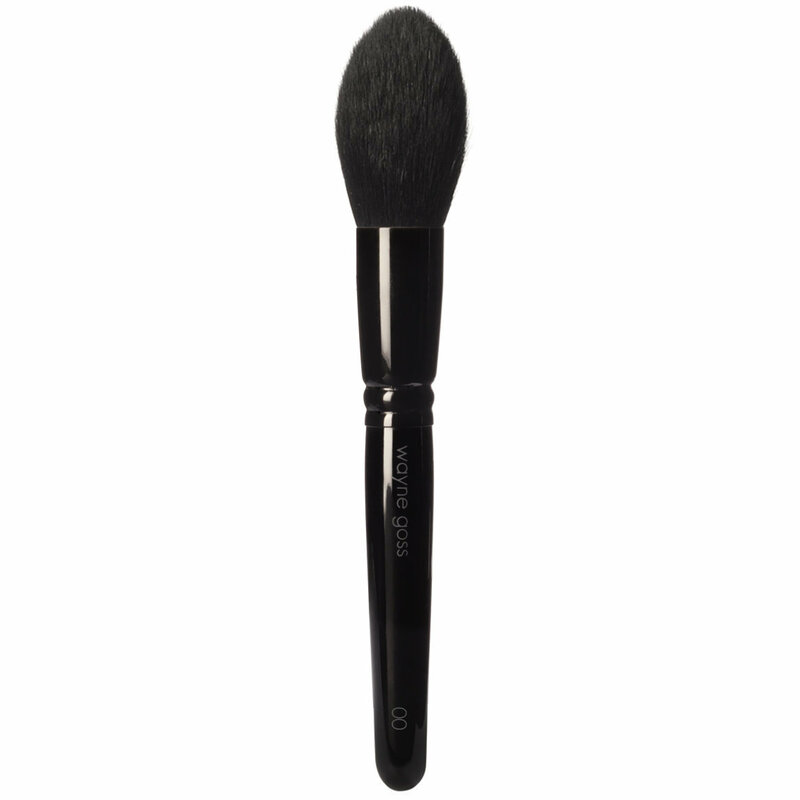 Thank you so much for carrying Wayne Goss Brushes! This brush is soft but not the softest brush I own. I find the price to be reasonable for the quality of this product. I haven't experienced any shedding, but I did have some color bleeding when I first washed this brush.